The Forum is a multi-purpose indoor arena in Inglewood, California, United States, adjacent to Los Angeles. Located between West Manchester Boulevard, across Pincay Drive and Kareem Court, it is north of the under-construction Los Angeles Stadium at Hollywood Park and the new Hollywood Park Casino. It is about three miles east of Los Angeles International Airport (LAX). Opening on December 30, 1967, the Forum was an unusual and groundbreaking structure. Architect Charles Luckman's vision was brought to life by engineers Carl Johnson and Svend Nielsen, who were able to engineer the structure so that it had no major support pillars. This had previously been unheard of in an indoor arena the size of the Forum. The arena is visible on the landing approach to the LAX from the east. With Madison Square Garden, it was once one of the best-known indoor sports venues in the U.S. The Forum achieved its greatest fame as home to the Los Angeles Lakers of the National Basketball Association and the Los Angeles Kings of the National Hockey League from 1967 to 1999, when the teams moved to Staples Center to join the Los Angeles Clippers (who moved to Staples Center from the Los Angeles Memorial Sports Arena). The Forum was also the home of the WNBA's Los Angeles Sparks from 1997 to their 2001 move to Staples Center. The Forum was the site of the 1972 and 1983 NBA All-Star Games, the 1981 NHL All-Star Game, 1984 Olympic basketball and hosted the Big West Conference (from 1983 to 1988) and the 1989 Pacific-10 Conference men's basketball tournaments. It was acquired in 2000 by the Faithful Central Bible Church, which used it for occasional church services and leased it for sporting events, concerts and other events. In 2012, the Forum was purchased by the Madison Square Garden Company (MSG), owners of New York City's Madison Square Garden, for $23.5 million; MSG announced plans to renovate the arena as a world-class concert venue. On September 24, 2014, the Forum was listed on the National Register of Historic Places. The arena is formally known as The Forum Presented by Chase, and has previously been known as the Great Western Forum and nicknamed the "Fabulous Forum" in a newspaper headline. It is also known informally as the L.A. Forum. On the site of a former golf course, the "fabulous" Forum (as it was colloquially known to locals) was built in 1967 by Jack Kent Cooke (owner of the Lakers and founding owner of the Kings). The Canadian Cooke, who enjoyed ice hockey, was determined to bring the NHL to Los Angeles. In 1966, the league announced that it was selling six new franchises, and Cooke prepared a bid. The Los Angeles Memorial Coliseum Commission, which operated the Los Angeles Memorial Sports Arena, supported a competing bid headed by Los Angeles Rams owner Dan Reeves—who already had a hockey team at the Arena, the Western Hockey League's Los Angeles Blades—and told Cooke that if he won the franchise, he would not be allowed to use the facility. In response, Cooke planned to build a new arena in the Los Angeles suburb of Inglewood. Nearly 30 years later, Cooke told Los Angeles Times sportswriter Steve Springer that he remembered "one official representing the commission laughing at him" when Cooke said he would build in Inglewood. Cooke won the franchise, paying $2 million for the Los Angeles club, which he called the Kings. According to Springer, "Cooke went to Inglewood and built the Forum. Goodbye, Lakers. Goodbye, Kings." The round, $16 million building was designed by Los Angeles architect Charles Luckman to evoke the Roman Forum. The arena seats 17,505 for basketball, 16,005 for hockey and up to 18,000 for musical concerts; although it has no luxury suites, it had 2,400 club seats for events. More than 70% of the seats are between the goals, and no seat is more than 170 feet (52 m) from the playing surface. Steve Ballmer, who owns the Los Angeles Clippers, is looking to build a new arena blocks away from The Forum. The arena would compete directly with The Forum in regard to concerts and other large scale events. The Clippers' current lease at the Staples Center expires in 2024, and Ballmer is hoping that the team can have its own basketball-specific arena. Several lawsuits were filed to attempt to prevent the construction of the competing arena. In December 2018, the Clippers filed a countersuit against The Madison Square Garden Company alleging that the company is trying to prevent competition. In March 2019, leaked emails revealed that Irving Azoff attempted to lure the Los Angeles Lakers back to The Forum after their lease at the Staples Center was up. 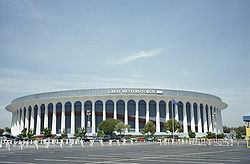 Despite nothing coming of the proposal, Azoff's proposal to re-purpose The Forum was seen as a way of preventing the LA Clippers from building their own arena in Inglewood and ensuring that the Madison Square Garden Company got an unfair advantage over rival AEG, which already owns part of the Lakers. The Forum became a landmark in greater Los Angeles, largely due to the Lakers' success and the Hollywood celebrities often seen there. It hosted tennis matches, music concerts, boxing matches and U. S. political events. The arena is sometimes called the "Los Angeles Forum" or the "L. A. Forum" to distinguish it from other places with the name "Forum". Cream played two shows during the band's farewell tour, on October 18–19, 1968, with Deep Purple the opening act. The band's show of October 19 produced the live tracks on their farewell LP, Goodbye. Deep Purple also recorded their part of the show, which was later released as a live album entitled Inglewood – Live in California. The Rolling Stones performed at the Forum during their 1969, 1972 and 1975 North American tours. Steppenwolf played there during their At Your Birthday Party tour on July 14, 1969, with Three Dog Night the opening act. Three Dog Night recorded their set, which was later released as a live album entitled Captured Live at the Forum. Between 1970 and 1977 Led Zeppelin performed 16 times at the Forum, including a run of six sold-out dates in 1977. Part of their live album, How the West Was Won, was recorded at the arena. The band's first 1977 show is the source of the bootleg Listen to This Eddie. Another bootleg from the Forum shows, For Badgeholders Only, contains one of the last live performances by Keith Moon on drums, with his surprise performance there. The Jackson 5 performed twice at the Forum: on June 20, 1970 during their first national tour and on August 26, 1972 during their third national tour. The 1970 show broke attendance records, with 18,675 paid admissions and a gross income of $105,000 (when the Jackson 5 had released two albums and three singles). By 1972, they had released seven albums on Motown, in addition to Michael and Jermaine Jackson's solo albums. Both shows were recorded and released as Live at the Forum. On November 14, 1970 Elvis Presley played afternoon and evening shows, with 18,700 and 18,698 paid admissions. He returned for two more sold-out shows on May 11, 1974, with 18,500 paid admissions each. The Osmonds performed two shows on December 4, 1971, which were recorded and released as The Osmonds Live. Barbra Streisand performed on April 15, 1972, during a fundraiser for George McGovern's presidential campaign. Although ticket prices ranged from $5.50 to $100 and the event grossed $300,000, after expenses were deducted McGovern's campaign received only $18,000. During her set, Streisand asked the audience to choose between "Second Hand Rose" and "Stoney End" for her next song; the latter was the overwhelming choice. Her performance was recorded and released as Live Concert at the Forum. Bob Dylan's live album Before the Flood with The Band was compiled from songs performed at the Forum over the course of three shows on February 13 and 14, 1974. The only song on the album not recorded at the Forum was "Knockin' on Heaven's Door", which was recorded in New York City. Kiss played twice there in 1976 on February 23–24, three-four days after their footprints were imprinted on the 20th at Grauman's Chinese Theatre in Hollywood and played three more shows the following year, 1977, on August 26–28, with tracks from these 1977 shows included on their second live album, Alive II, released in October of that same year. On June 21, 1976, Paul McCartney and Wings began a three-night stand at the Forum during their Wings Over the World tour. The shows were McCartney's first live performances in Los Angeles since he played at Dodger Stadium in 1966 with the Beatles. Some songs played at the Forum appeared on the Wings Over America live LP released later that year and re-released in 2013. The Eagles performed three shows during their Hotel California tour on October 20–22, 1976. The shows were recorded, with some songs appearing on Eagles Live. The Bee Gees appeared at the Forum during their Children of the World tour on December 20, 1976; the show was recorded and released as Here at Last... Bee Gees... Live. Parliament-Funkadelic recorded half of their live album, Live: P-Funk Earth Tour, at the arena on January 19, 1977. KISS played three shows during their Love Gun Tour on August 26–28, 1977; the shows were recorded and released as Alive II. The Los Angeles Strings of the World Team Tennis league played home matches at the Forum from 1975 to 1978, led on the court by Chris Evert. The team was owned by Los Angeles businessman Jerry Buss. In 1979, Cooke sold the Forum, the Lakers and the Kings to Buss for a then-record $67.5 million. The Lakers were successful during the 1980s, winning five NBA championships and making the NBA Finals every year except 1981 and 1986. The Lakers' owner, Jerry Buss, also purchased the Los Angeles Strings expansion franchise of TeamTennis (the original team and league having folded in 1978) and appointed his 19-year-old daughter Jeanie Buss as the tennis team's general manager, with all home matches played at the Forum. In 1981, Diana Ross filmed the concert portion of her Diana television special at the Forum, entering the arena through the audience and singing her 1980 Billboard top-five hit "I'm Coming Out". Guests included Quincy Jones (who conducted a performance of "Home" from The Wiz) and Michael Jackson, who joined Ross onstage for a performance of her 1980 number-one song "Upside Down". The special began with Ross in a photo session atop the Forum in a silver lamé bodysuit with large, silver-lamé wings. On December 10, 1981, Devo performed at the Forum during their New Traditionalists tour. In April 1982, the Forum was the site of the "Miracle on Manchester", in which the Kings overcame a 5–0 deficit in a first-round Stanley Cup playoff game against the Edmonton Oilers to win 6–5 in overtime. With additional upset wins in Games 1 and 5 of the five-game series, the Kings eliminated the heavily favored Oilers to reach the second round. In September 1982, on their Hot Space Tour, Queen played their final U.S. concert ever at The Forum. Fleetwood Mac played two shows during its Mirage tour on October 21–22, 1982, with Dave Mason opening. The shows, originally scheduled for October 4–5, were postponed when Stevie Nicks developed walking pneumonia. They were recorded for the band's tour video, which was televised in 1983. In 1984, the Forum hosted the basketball tournaments and the men's handball finals of the 1984 Summer Olympics. The arena hosted Amnesty International's June 6, 1986 A Conspiracy of Hope benefit concert, headlined by U2 and Sting and featuring Bryan Adams, Jackson Browne, Peter Gabriel, Lou Reed, Joan Baez and the Neville Brothers. In 1989, Neil Diamond set the all-time attendance record at the Forum by surpassing his already leading record of seven sold-out shows (in 1983) with eight sold-out shows. For doing so, Diamond was presented with a gold plaque, stating his accomplishment(s). In December 1988, Jerry Buss sold the arena's naming rights to Great Western Savings & Loan, coinciding with the arrival in Los Angeles of hockey star Wayne Gretzky. The building exterior was repainted blue, replacing its original "California sunset red." It was renamed the Great Western Forum; the name was retained for several years, after Great Western was acquired by Washington Mutual (now Chase) and ceased to exist. Although naming-rights agreements became commonplace in major American sports, they were rare at the time of Buss's deal with Great Western. There was some initial criticism of the name change, and local residents continued to call the arena "the Forum." Adverse reaction was eventually muted; Great Western Forum sounded like a natural name because of the arena's location in the western United States. Before the 1991–92 NBA and NHL seasons, a new scoreboard was installed, replacing the one in use since the building opened in 1967. The original scoreboard, designed by All American Scoreboards in Pardeeville, Wisconsin, had a two-line message board on each side (the third electronic message board in the NHL, and the second in the NBA). The new scoreboard, designed by Daktronics, kept the two-line message boards and added a Sony Jumbotron scoreboard on each side. However, by the middle of the decade the Great Western Forum was considered too small; it lacked luxury boxes and had insufficient retail and commercial space. Los Angeles officials, seeking to redevelop the city center, began planning a new downtown sports arena and entertainment complex and hoped to attract the Lakers and Kings from Inglewood. The Kings' owners, who were real-estate developers, agreed to develop the complex (which became Staples Center); Buss agreed to move the Lakers into the new arena as co-tenants with the Kings and a third tenant, the NBA's Clippers, who would move there from the Los Angeles Memorial Sports Arena. The new arena opened in fall 1999; as part of the deal, Buss sold the Great Western Forum to the L. A. Arena Company (which was controlled by the Kings' owners). On April 18, 1999, the Kings played their final regular-season NHL game at the Forum, a 3–2 loss to the St. Louis Blues, on the day that former King and Blue Wayne Gretzky played his final NHL game as a New York Ranger; their last game altogether at the Fabulous Forum was an 8–1 preseason win over the Mighty Ducks of Anaheim on September 20 of that year. Staples Center was still under construction, so the Kings played their remaining preseason home games at the San Diego Sports Arena and the MGM Grand Garden Arena in Las Vegas. The Lakers' 118–107 playoff loss to the San Antonio Spurs on May 23, 1999 was their last regular or postseason game played at the Forum; they played two preseason games there the following year before they moved to Staples Center. The Los Angeles Sparks played their 2000 season at the arena before following the Lakers and Clippers to Staples Center. The Great Western Forum hosted live events, offices and training facilities for the 2000–2001 Women of Wrestling season. Faithful Central Bible Church, with a congregation of over 12,000, purchased the Great Western Forum at the end of 2000 and began holding church services there on Sunday mornings. Unlike Houston's Lakewood Church, which converted the former Summit into their church, Faithful Central representatives said that they never intended to convert the arena for religious purposes; in 2009, the church discontinued the regular use of the Forum for services. During the Faithful Central ownership, the arena was available for concerts, sporting events and other activities requiring a large venue. It was owned by the church's for-profit entity, Forum Enterprises, which accommodated secular and pop-music artists. The church influenced the approval of performers, however; in 2005 and 2009 the Forum refused to allow performances by heavy metal band Lamb of God, whose former name was Burn the Priest. On February 14, 2003, Phish began their first post-hiatus tour at the Forum. A fan jumped onstage during "AC/DC Bag", and they performed a cover of Dr. Hook & the Medicine Show's "The Cover of Rolling Stone" after appearing on the magazine's cover. In 2003 Great Western's naming-rights contract on the building expired, and Forum Enterprises changed the venue's name back to "the Forum". The Great Western corporate logo and the words "Great Western" remained on the building's exterior until 2006. The Forum was made available for film use, including interior shots for the 2002 film Like Mike. The Foo Fighters used the building as a setting for the music video for "All My Life" in 2003, featuring the building's exterior in its opening and closing shots. In 2008, a scene for the 2009 film Hannah Montana: The Movie and the video for Weezer's "Troublemaker" (from their 2008 Red Album) were filmed outside the Forum. Iron Maiden appeared during their Somewhere Back in Time World Tour on February 19, 2008, with Lauren Harris their opening act. Their live version of "The Number of the Beast" was included on the documentary Iron Maiden: Flight 666. In May and June 2009, Michael Jackson rehearsed at the Forum for his This Is It concert series in London. After Jackson died on June 25, 2009, footage of these rehearsals and those at Staples Center became part of Michael Jackson's This Is It. On October 9, 2009, the Lakers returned to the Forum for a preseason game against the Golden State Warriors to celebrate the team's 50th season in Los Angeles; the Lakers lost, 110–91. Because the scoreboard was removed by the church, a temporary scoreboard and video monitor were brought in for the game. In 2011, Prince began a 21-show run at the Forum. After acquiring the arena in June 2012, the Madison Square Garden Company announced plans for a $50 million renovation. The City of Inglewood made an $18 million commercial-rehabilitation loan, contingent on MSG's $50 million investment. The arena was renamed "The Forum, presented by Chase" to reflect its sponsor, Chase Bank (which had incidentally purchased Great Western's legal successor, Washington Mutual, a few years earlier), and its exterior returned to the original red. New features also included new lighting, new seating, LED video systems and HD screen and new retail. The Forum reopened with six concerts by the Eagles during their History of the Eagles – Live in Concert tour on January 15, 17, 18, 22, 24 and 25, 2014. On March 15–16, the Forum hosted the men's freestyle wrestling World Cup. On May 17, 2014, The Forum hosted its first boxing card since 2001. Mexican Juan Manuel Márquez defeated Mike Alvarado for the WBO international welterweight championship, for the right to challenge world champion Manny Pacquiao. The event was broadcast by HBO's Boxing After Dark, the first time since its 1996 premiere that the series presented a card from the Forum. On May 16, 2015, Gennady Golovkin defeated Willie Monroe, Jr. during a live broadcast on HBO Boxing. Golovkin returned the following year on April 23, 2016 to battle Dominic Wade, which resulted in a second-round KO. On August 24, 2014 the arena hosted the 2014 MTV Video Music Awards, the first major awards show at the Forum. The arena was added to the National Register of Historic Places on September 24, 2014. On June 4, 2016, the UFC 199 mixed martial arts event was held at The Forum. The Forum was also the venue of the 2015, 2016 and 2018 Nickelodeon Kids' Choice Awards. In addition, the Forum has also hosted the 2016 iHeartRadio Music Awards, 2016 American Country Countdown Awards and the 2016 Teen Choice AwardsJuan Gabriel performed his final concert of his career on August 26, 2016. Gabriel died two days later. It hosted the 2017 MTV Video Music Awards on August 27, 2017. On February 24, 2018, The Forum hosted the world championship Super Flyweight boxing match between Juan Francisco Estrada and Srisaket Sor Rungvisai. The Forum has also hosted the KROQ Almost Acoustic Christmas since 2014. On December 29, 2018, the UFC 232 mixed martial arts event was held at The Forum as part of a short notice decision. The Forum is slated to host the Gymnastics events for the 2028 Summer Olympics. ^ "Svend Nielsen Obituary - Riverside, CA | The Press-Enterprise". Legacy.com. Retrieved 2018-11-12. ^ a b Vincent, Roger (June 26, 2012). "Forum Owners Plan to Revive Venue with $50-Million Renovation". Los Angeles Times. Retrieved June 26, 2012. ^ Bond, Paul (July 30, 2013). "L.A.'s The Forum to Get $76.5 Million Makeover and Reopen With Eagles Concerts". The Hollywood Reporter. Retrieved August 16, 2014. ^ Adelson, Andrea (December 7, 1988). "THE MEDIA BUSINESS; Great Western's Name On Los Angeles Forum". The New York Times. Retrieved August 16, 2014. ^ "Stand by for the resurrection of boxing at the Fabulous Forum". Los Angeles Daily News. March 28, 2014. Retrieved August 16, 2014. ^ Velin, Bob (May 18, 2014). "Marquez defeats Alvarado in slugfest at L.A. Forum". USA Today. Retrieved August 16, 2014. ^ Gustkey, Earl (March 11, 1990). "Lakers Don't Have Forum's Only Championship Rings : Boxing: Jerry Buss would like to average a world title fight a month in the building where the Lakers and the Kings play". Los Angeles Times. Retrieved August 16, 2014. ^ Bass, Alan (2011). The Great Expansion: The Ultimate Risk That Changed the NHL Forever. pp. 87–9. ISBN 1-4502-8605-4. ^ Lewis, Randy (July 30, 2013). "The Forum's legacy: A key force in the birth of arena rock". Los Angeles Times. Retrieved August 16, 2014. ^ reports, From NBA media. "LA Clippers owner Steve Ballmer still seeking Inglewood arena for team - NBA.com". ^ "Inglewood residents sue to block Clippers arena". ^ Spada, James; Nickens, Christopher (1981). Streisand: The Woman and the Legend. Garden City, New York: Dolphin Books, an imprint of Doubleday. p. 149. ISBN 0-385-17567-1. ^ "DEVO Setlist at The Forum, Inglewood". setlist.fm. ^ "Devo Live Guide - 12/10/81 - The Forum, Englewood, CA". huboon.com. ^ 1984 Summer Olympics official report. Volume 1. Part 1. pp. 102–4. ^ Grein, Paul; Goldstein, Patrick (April 9, 1989). "The Paradx of Neil Diamond". Los Angeles Times. Retrieved December 12, 2017. ^ Horovitz, Bruce (December 6, 1988). "They're Banking That It's a Great Advertising Forum". Los Angeles Times. Retrieved February 11, 2014. ^ Sanders. "Great Western, for example, never convinced Southern Californians to embrace the bank's name when referring to the former Forum in Inglewood despite its $17.8-million sponsorship deal." ^ Zitner, Arron. (May 15, 1993). "A BANK SHOT FOR NEW GARDEN HIGH-INTEREST BIDDING TO NAME ARENA REPORTEDLY YIELDS SHAWMUT CENTER", Boston Globe "'I don't believe I've heard anyone on the street call it the Great Western Forum', Kupper said." ^ Hirsch, Jerry (December 29, 2000). "Church to Buy Forum in $22.5-Million Deal". Los Angeles Times. Retrieved February 11, 2014. ^ Crowe, Jerry (May 17, 2009). "A Funny Thing Happened Along the Way to the Forum". Los Angeles Times. Retrieved February 11, 2014. ^ Edwards, Gavin (April 15, 2011). "Prince Kicks Off 21-Concert Residency With Epic Three-Hour Show". Rolling Stone. Retrieved October 22, 2015. ^ "The Madison Square Garden Company Acquires Famed Forum Arena" (Press release). New York City: The Madison Square Garden Company. GlobeNewswire. June 26, 2012. Archived from the original on May 17, 2014. Retrieved August 16, 2014. ^ Bachrach, Eve (July 30, 2013). "Here's What the Revamped Inglewood Forum Will Look Like". Curbed Los Angeles. Retrieved August 16, 2014. ^ "Great Western Bank, A FSB". www.usbanklocations.com. ^ Lewis, Randy (July 30, 2013). "The Forum Aims to Rock Rival Staples with Major Renovation". Los Angeles Times. Retrieved July 30, 2013. ^ "Eagles to Reopen The Forum With 3 Concerts in January". Eagles. Retrieved October 12, 2014. ^ "Pool draw & team pairings set for Freestyle World Cup in Los Angeles, Calif., March 15–16". Retrieved October 12, 2014. ^ "Juan Manuel Marquez earns unanimous decision win over Mike Alvarado in elimination bout". ESPN. Retrieved October 12, 2014. ^ "Gennady Golovkin Defeats Willie Monroe Jr and Scores 20th-straight Knockout". ^ "Gennady Golovkin Stops Dominic Wade in 2nd Round to Retain Title". Retrieved April 24, 2016. ^ "The 2014 MTV Video Music Awards Are Going Back To Cali". MTV News. Retrieved October 12, 2014. ^ "Weekly List of Actions Taken on Properties: 9/22/14 Through 9/26/14". National Park Service. Retrieved October 3, 2014. ^ Dave Doyle (2015-12-13). "UFC 194 results: Luke Rockhold stuns Chris Weidman to win middleweight title". mmafighting.com. Retrieved 2016-03-17. ^ "2016 Nickelodeon Kid's Choice Awards Press Kit | Nickelodeon KCA Press Kit". nickkcapress.com. Retrieved April 22, 2016. ^ "iHeartRadio Music Awards 2016: 5 Things You Need to Know". Retrieved April 3, 2016. ^ "2016 American Country Countdown Awards Winners". Retrieved May 1, 2016. ^ "Teen Choice Awards 2016 Red Carpet: Photos of 'TVD' Stars, YouTubers, 'Fuller House' Cast & More Celebs". Retrieved July 31, 2016. ^ "Juan Gabriel last performance at the Forum ABC News". Associated Press. August 26, 2016. Retrieved August 31, 2016. ^ "VMAs: What to Watch for at MTV's 2017 Awards". ^ "Sor Rungvisai-Estrada to headline 'Superfly 2'". ^ "Jon Jones drug test nets 'atypical finding,' UFC 232 moved to Los Angeles on one week's notice". MMAjunkie. 2018-12-23. Retrieved 2018-12-24. Wikimedia Commons has media related to The Forum (Inglewood).